1- Cut 2 squares of fabric 10 x 10 inches. 2- Cut 2 squares of fabric 9 x 9 inches. 3- Cut 2 strips of fabric 3 x 20 inches for handles. 4- Cut around the edges of the squares with the pinking scissors. do the same with the other strip. The strips will be the handles for the purse. do the same for the other side of the purse. 8- Provide the child with more felt, glitter, and pretty jewels to decorate. My girls will enjoy working on this project. The fun part starts by buying the materials with them, let them choose the colors, etc. Sounds like a lot of fun. I think this is a great project for girls and boys. 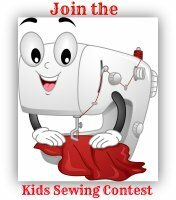 Remember boys can learn to sew and they can learn to make gifts for Mother's Day or a sister's birthday. Keep the great ideas flowing Angeles. Angeles, your project sounds like it is lots of fun. 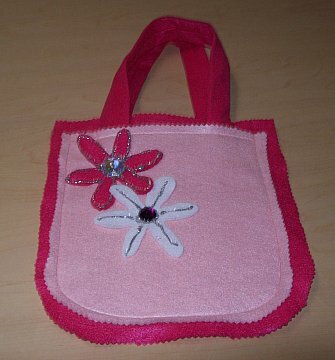 It gives a young girl a chance to sew something she can use, and be creative with the decorating (and choice of fabrics)! 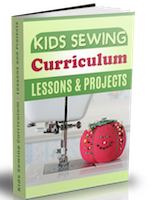 I think this is a nice project for girls, it is easy, practical, pretty, and a child can do it in no time at all. Can we see a picture of the project? Best regards for this project.